Spend the day enjoying the fresh air, panoramic views, natural wildlife and history of the impressive Lake Suchitlán, the largest inland body of water in El Salvador. Thousands of migratory birds visit the lake throughout the year. With a boat tour to the Island of the Birds, you will see an amazing variety of species that, for reasons unknown, have chosen this particular island for nesting. Along the way, you´ll also discover the curious species of duck that makes the sounds of the pig! Come and enjoy our lovely Puerto San Juan, the ideal place for resting and relaxing, while enjoying the breezes from Lake Suchitlán. Here you will also find numerous restuarants that serve Salvadoran cuisine, places to purchase Salvadoran crafts, and a park area for viewing the lake and birdwatching. The region of Guazapa Volcano is rich in history and nature. The greater part of the volcano is abundant in trees, plants, birds and animals.You can learn much about the important role this volcano played in the Civil War and see vestiges from the conflict with a tour on foot or on horseback. When you are in the area of Guazapa Volcano, look carefully at the moutain´s shape to find the form of the "Sleeping Woman." Cihuatán is one of the most important pre-Hispanic settlements in Mesoamerica. In this archaeological park, you will see the remains of a ceremonial ball court, temples and other ceremonial centers, and a pyramid. 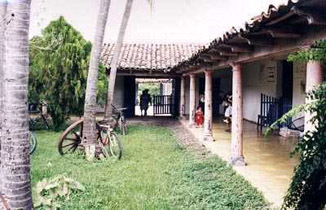 A museum within the park displays some of the finds from Cihuatán and explains the history of the site. To learn more about Cihuatán, click here. Located in the village of La Bermuda, only 8 km from the city center of Suchitoto, the Centro Recreativo Las Americas offers three swimming pools, food and picnic areas. A day spent in this secluded corner of Suchitoto is the perfect way to make the most of your free time. The nearby Cinquera Forest has 5,320 hectares of protected flora and fauna. It is truly a natural treasure of El Salvador. During your visit to Cinquera, you can hike along the paths of the Cinquera Forest in order to reach magnificent lookout points that offer panoramic views of the country. As well, the area is rich in history from the Civil War, and you can see several remnants from this timeperiod, including a guerrilla encampment and a guerrilla kitchen, designed to disperse the smoke from cooking fires in order to avoid detection. 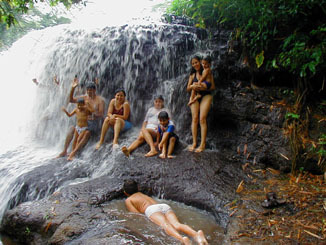 The Los Limones waterfall is the juncture of a series of small cascades where two rivers, Chalchigue and Los Amates, meet and form successive platforms of water. The site is very open, and the width can exceed 50 meters in some places, making it a great swimming-hole admist the tranquility and beauty of its natural surroundings. 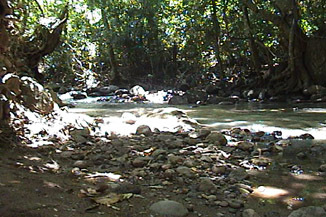 Quezalapa River, which is the Nahuat word for the Quetzale bird, is one of the few crystal-clear rivers in El Salvador containing areas with fish and vegetation along its shore. Here, you can enjoy a tranquil environment in direct contact with nature. There are plenty of places to swim, walk, or, if you prefer, just rest among the trees. This 200 year old hacienda is one of the few colonial period haciendas in El Salvador that has been preserved and remains in good condition. Today, you can enjoy yourself thoroughly at the hacienda. Attractions include a protected natural reserve, an artificial lagoon offering canoeing, bird watching and fishing, a sports field, horseback rides, antiques, locally-made crafts, a pool, lodging, and Salvadoran cuisine. This is the ideal place to spend time with your family, friends and camping groups. 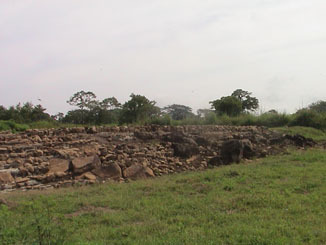 The second site of the capital San Salvador was founded in 1528 just 9 km from the city of Suchitoto. Though the Spaniards ended the power of the indegenous Pipils, they were still the target of frequent attacks, and eventually moved the capital to its present-day location in 1545. However, the foundations of this original settlement remain and more continue to be discovered through excavation, including the remains of the first Catholic Church in El Salvador. 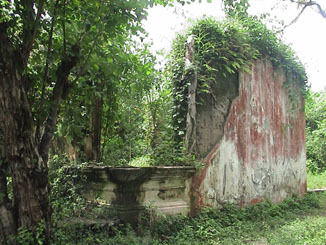 Built around 1528, the ruins of Hacienda La Bermuda today hint at the walls, windows and doors that once composed this structure from the Colonial Era. The walls were constructed of adobe with stone foundations and in one of the corners, you can still see a gated corner-window with its ornate decorative detailing work well-conserved.